Court documents obtained today debunk the view that Shakil Afridi was convicted for working with the CIA. 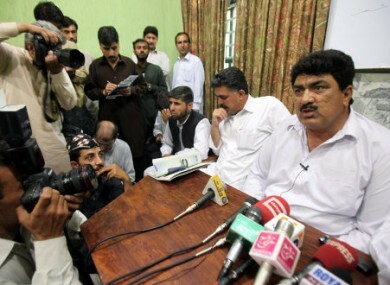 Jamil Afridi, right, brother of Shakil Afridi, speaks at a news conference in Peshawar on Monday. A PAKISTANI DOCTOR who assisted the CIA in tracking down Osama bin Laden was sentenced to 33 years in prison for conspiring with an Islamist militant commander, a verdict that could make it more difficult for Washington to argue for his release. The judgment against Shakil Afridi debunked the widely held assumption that he had been convicted for his involvement with the American spy agency. The decision referred to unspecified evidence that Afridi had “acted” with foreign intelligence agencies, but went on to say any charges related to that couldn’t be considered because the court didn’t have jurisdiction. The Associated Press obtained a copy of the five-page document, first reported by Pakistan’s Dawn newspaper today. Earlier this week, Afridi’s family and lawyers said he was innocent and would appeal, but said they had not yet seen the court verdict. They refused to comment on his relations with the CIA. The trial was carried out in a court in the country’s tribal regions close to Afghanistan. A political official, in consultation with tribal elders, ruled on the case in secret. The US has called for Pakistan to release Afridi, and his punishment has become another flashpoint issue in the fractured relations between the two countries. Pakistan’s army was outraged by the unilateral US raid that killed bin Laden in May 2011 because it was a violation of the country’s sovereignty and added to perceptions it was a sponsor of terror. Afridi ran a vaccination campaign on behalf of the CIA to collect blood samples from bin Laden’s family at a compound in Abbottabad where US commandos killed the al-Qaida leader. It was unclear whether he succeeded, but US officials have publicly said he helped the effort to track bin Laden. The fact Afridi was technically convicted for militancy, not helping the CIA, could complicate Washington’s efforts to press for his release. Pakistan could argue that his trial was an internal matter that has nothing to do with the United States. The verdict said Afridi was guilty of conspiring with a militant group led by commander Mangal Bagh. It said he gave money to the group and treated its leaders at a hospital in Khyber when he was stationed there. According to unnamed witnesses, he did this because of his “deep affiliation with the group.” Others, also unnamed, said the group planned terrorist attacks in Afridi’s office. The verdict, which was passed down last week, found Afridi guilty of “conspiring against the state” and other charges. Pakistani officials didn’t attempt to correct widespread reports that the charges referred to his work with the CIA. The verdict triggered anger in the US and elsewhere, with many questioning how helping kill bin Laden — a sworn enemy of Pakistan — could be seen as working against the state. The full text of the verdict means Pakistan can now, technically at least, deflect that criticism. Afridi’s motivation for working with the CIA or whether he was aware who was employing him has never been established. He was once the top medical officer in the Khyber region. Speaking last week, a friend said he had once been kidnapped by Mangal Bagh’s group and paid a heavy ransom for his release. The friend didn’t give his name because he didn’t want to attract attention to himself. Email “Doctor who helped CIA trace bin Laden 'jailed over militancy'”. Feedback on “Doctor who helped CIA trace bin Laden 'jailed over militancy'”.